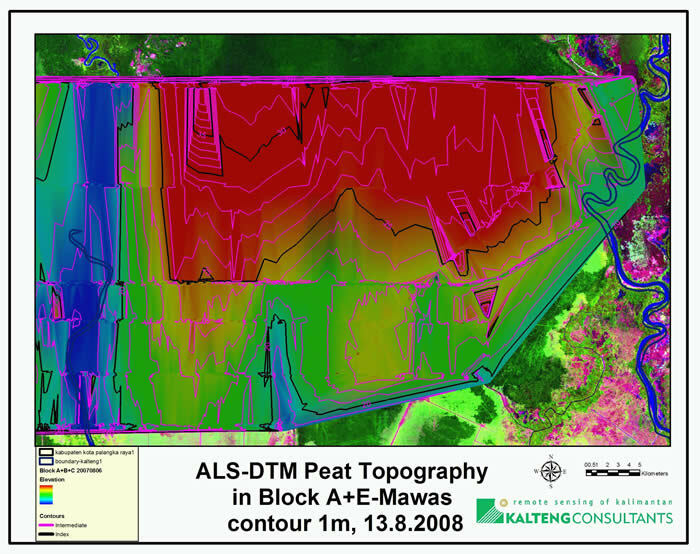 With a high-resolution Airborne Laser Scanner (ALS) the topography of peatlands was measured on 5th, 6th and 7th Aug. 2007 by a helicopter to achieve a 3-dimensional Digital Elevation Model (DEM) for the CKPP Block A + B + C + E.
With this ALS-information we processed and analysed the topography of peatland with an elevation resolution of +/-15cm and x-, y- of 0.5m in the Ex-Mega Rice Project (Ex-MRP). The 1.5µm laser beam in the near infra-red with the beam divergence of 0.5mrad could penetrate the PSF by 3% to 5% of the laser-pulses. The highest peat dome was found between rivers Kahayan and Mangkatup with 37.5m at the track approx. 229km south of the equator. The highest peat dome in Mawas area between Kapuas and Mentangai river at 229km is 32m and at -238km 29m. In Block A at main channel we get an elevation maximum of 25m (-247km) between rivers Kapuas and Mentangai. At Mentangai river on main channel we have the lowest point of this cross-section with 21.3m. Right from Mentangai on main channel we found the highest elevation of approx. 23m. The peat dome in Block A drops down to 22m between Kapuas and Mentangai at -261km. 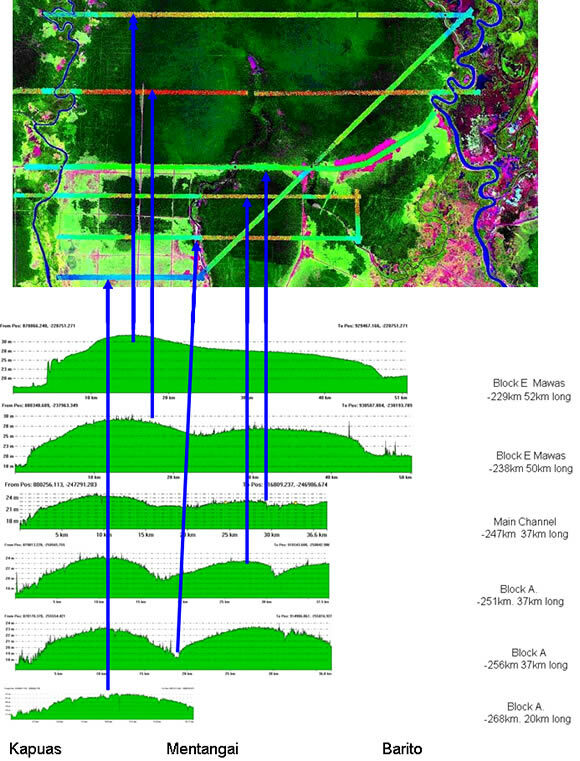 Peat Dome of Block E-Mawas and Block A, elevation calibrated to Palangka Raya Airport reference point with 25m, see figure with 6 profiles. The water-level on 5th August 10h - 11h near the main channel (approx. -247km) was 17.4m at Kahayan, 16.5m at Kapuas, 21.2m at Mentangai and 19.9m at Barito. The forest situation has changed drastically in the so called Block A of the Ex-MRP. We used three Landsat images from 30.6.1991, from 16.07.2000 and the last from 05.08.2007, when we performed the ALS-flight trials on the same day over the Main Channel. We used for comparison of the Peat Swamp Forest (PSF) situation an area of 132,111ha in Block A between rivers Kapuas and Barito and South of Main Channel. These two rivers were excluded in the analysis. All PSF seems to be secondary forest. Even in 1991 the area was logged by concessions, partly heavily, Between rivers Mengkatip and Barito the land was cleared still in 1991 completely. The PSF situation of 1991 with 87,973ha was divided into 34,216ha PSF left from Mentangai to Kapuas and 53,757ha right from Mentangai to Barito respectively to Mengkatip. The rate of PSF decrease was in 16 years 4.6% per year.